Along with industry partners, BOBST demonstrates transformative technologies to the country’s leading label and packaging manufacturers. 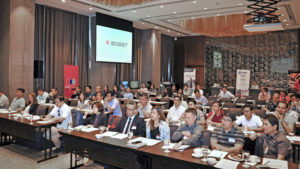 BOBST & industry Partners hosted a roadshow in May 2018 at the Marco Polo Ortiga hotel in Manila, in the Philippines to demonstrate transformative technologies to the country’s leading label and packaging manufacturers. Illustrated by BOBST’s specialists from different product lines and services organization, by Mouvent, the BOBST Competence Center for digital printing, and by the representatives of partner companies – Atlas Converting, Coim, Dow, Esko, Flint Group, Kodak, Macchi, TKM – the presentations highlighted innovations that can add real value to label and packaging production. The equipment presentations spotlighted the performance and technologies of printing and converting equipment along the production chain from film extrusion to slitting-rewinding by way of vacuum metallizing, CI and inline flexo printing, gravure printing, digital printing, and lamination. These were complemented by the latest updates on the new generation adhesive systems, UV curable low migration inks for food packaging applications, flexo plate and doctor blade technology. In addition, BOBST also presented its first-class services capabilities which is key to the Bobst Group’s market leading position in South East Asia. The future of flexo printing with extended color gamut (ECG) technology drew great interest from the audience. In narrow and mid-web inline flexo, lines like the M5 provide a huge appeal for converters thanks to the unique Digital Flexo technology and their flexibility of configuration suitable for labels, flexible and carton packaging production. In wide-web CI flexo printing, the 20SEVEN press brings to a new level process consistency and repeatability which makes it ideal for the requirements of the ECG process. For gravure printing, the focus was on the bestselling RS 5002 gravure printing press for flexible packaging and also on the broad spectrum of application requirements handled by the dedicated configurations of the RS 6003 platform. The compact CL 750 multi-technology and SL 750 solventless machines covered developments in lamination, whereby another presentation focused on how BOBST’s range of equipment, like the very latest K5 VISION and process technologies can meet all market needs in vacuum matallizing. The latter raised a great deal of interest in the audience as more and more companies are looking to invest and produce metallized and clear barrier films locally to fulfill demand that is growing at a fast pace in South East Asia. “BOBST has succeeded in developing innovations like the AlOx technology for clear barrier film and in making them viable industrial solutions” explains Eric Pavone, Business Development Director of BOBST Business Unit Web-fed “We are also in the front line of many more developments in this field, also as turnkey solutions and for subsequent processes like coating and printing”. “Demand for high quality labels and high performance packaging is growing and the Philippine industry continues to make progress” comments Sebastien Geffrault, Zone Business Director, South East Asia Pacific, BOBST Business Unit Web-fed “Local converters are looking to invest in efficient equipment that delivers the packaging quality demanded by increasingly demanding consumers and makes them competitive vis-a-vis imported packaging” .